The Justice League movie has been under a microscope since the very talk of it surfaced years ago. Whether it was the script, the casting, or that Zack Snyder was still directing it, every possible facet of the movie was criticized in one form or another. There has been much talk about the length of the film, that the studio mandated that the runtime come in under two hours, forcing the filmmakers to cut nearly 45 minutes of the film. Does the movie suffer due to any of these reasons? Not really, as I thought Justice League was pretty damn good if a bit short. Before you read any further, do take note that I am going to mention and talk about a certain member of the Justice League that appears in the film. If you weren't expecting this character to be in the movie, then I'm rather shocked. So yes, I will mention that Superman is, in fact, present in some capacity in the movie. How, and why, that I won't explain, but rather, how he is handled and what I thought about the whole mustache debacle. Since I brought it up, let's discuss Mustache-gate. Months ago, Zack Snyder left Justice League for family reasons as he and his wife dealt with the loss of their daughter. With his absence, Avenger's frontman, Joss Whedon, came in to finish the film. The studio was apparently not happy with several aspects of the movie and this led to several scenes being changed, added, removed, and more humor to be injected into the film. It was also rumored that Joss was hired to make the movie "more Marvel". While all the actors were available for these additional scenes, Henry Cavill was filming the newest Mission Impossible, and Paramount would not allow his mustache to be shaved off. This then led to WB needing to digitally remove it during these reshoots, costing the studio a big chunk of change. The problem? It was very noticeable. Nearly every scene with the man of steel has this weird look to his face and while it doesn't ruin the movie, the remaining visual effects featured in the film are not terribly great either and this digital mustache debacle is actually the least of their problems. The movie centers around the villain Steppenwolf, who previously attacked Earth before to capture and combine mystical cubes called the Mother Boxes. This led to a great war that saw the Amazons, Atlanteans, and the race of Men, join forces for the first time and together they defeated Steppenwolf. After this victory, each group hid a Mother Box from one another, hoping that Steppenwolf would never return. Steppenwolf himself is boring, he is a complete visual effect, and he doesn't feel as threatening as he should. This is a character that is on the same power level of Darkseid, albeit not nearly as popular. He never once shines here and comes off as just another lame comic book movie villain. While I'm glad they didn't go straight to Darkseid, as that villain needs far more setup, the way in which Steppenwolf is used here feels as though the villain was an afterthought and the main focus of the movie was how to bring the team together. The core team of the Justice League starts with Batman, Wonder Woman, Cyborg, Aquaman, and the Flash. The film allows each character to have a scene or two to introduce you to who they are and where they come from. These scenes can feel a bit too much like they are just dumping exposition on us, but considering they are introducing Cyborg, Aquaman, and the Flash for the first time in this movie, it does in some ways feel needed. I can't help but feel that several of the scenes that were cut would have helped flesh out these characters more instead of how quick they have to introduce them and get the team together. The movie originally had Iris West, the girlfriend of the Flash, as well as William Dafoe's character Nuidis Vulko, a character within the world of Aquaman. There was also reportedly a lot of scenes cut that featured the origins of Cyborg. Thankfully, there are some scenes crucial to the plot that remain here to at least allow these characters to feel like they belong in the movie. The two-hour runtime does compact a lot of the scenes to make them feel rushed or paced in such a way that you honestly feel like something is missing, that events are occurring just a bit too fast. This can also limit the screentime of certain characters like Aquaman who is barely featured in the movie at all and nearly all of the scenes he is apart of being featured in the numerous trailers. The Batman we see in the movie is more team orientated than previous versions of the character and is still feeling guilty about the death of Superman. Much of the movie focuses on his attempt to build the team as he is aware of a great evil that is going to swallow up the Earth. This allows him several moments to interact with each member of the team, especially Ezra Miller as the Flash, and Jason Momoa as Aquaman. I enjoyed Affleck's portrayal of the character in Batman v. Superman and found him to be nearly as good here. I wish this film had a scene as good as the warehouse fight in the previous film as Batman doesn't really have a solid fight scene here and feels far weaker than he should be. Gal Gadot surprised audiences with her solo film as it stands out as one of DC's most popular and successful movies of all time. The movie did remarkably well and has shattered numerous records with its much-deserved success. Gal brings the same energy and excitement to the role and is a stand out here as well. The only criticisms I have of how the movie handles her is Snyder's focus on her rear end in numerous scenes in the movie. The remaining members of the Justice League are well cast. I wasn't originally on board with Ray Fisher as Cyborg but I have to admit, the guy was great, even getting a "Boo-yah" in towards the end of the movie. The character was handled well despite a good chunk of scenes removed to help flesh his origins out. Ezra Miller was terrific as the Flash, even if he doesn't have the name yet. I'm a big fan of the TV show and was a bit hesitant on seeing another version of Barry Allen so soon, but the version they have created here is really enjoyable to watch, especially with his interactions with people, as this version is very socially awkward. Jason Momoa as Aquaman is a smart choice, but frankly, they don't do much with him. There is a neat scene where he opens up to the team, but apart from that, he was a walking soundboard of "my man!" or "I dig it", or other short bursts of dialogue. Aquaman is the next DC movie to hit theatres, so I am hoping we get to know him a bit better than what was offered here. Henry Cavill, who I think was a tremendous choice for Superman is back as possibly the best version of the character yet. He's more cheerful, more concerned with the safety of others, and doesn't hold back during the final encounter. 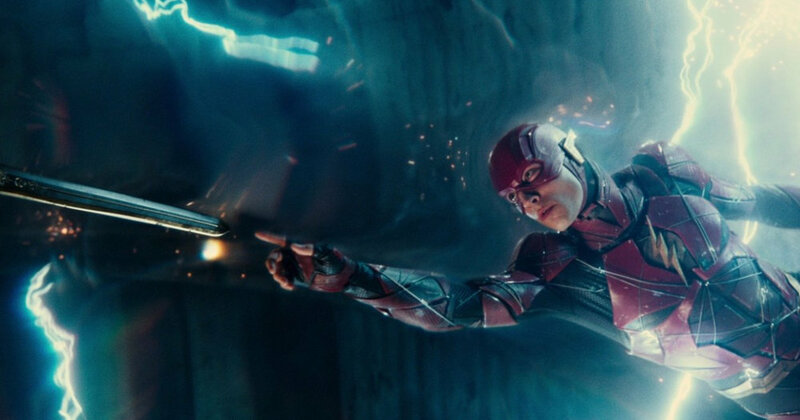 I like the way in which they brought him back into the movie and the scene with the Flash running around him was probably my favorite moment in the film. I'm eager to see another director helm Man of Steel 2 as the first film was devoid of color and hope. While the film is rather enjoyable, it fails to impress with much of its visuals. The costumes look great, the use of color is a much-needed element to these films, but the visual effects are lacking almost all across the board. Steppenwolf is probably the worst of the visual effects as he just doesn't look real in any way shape or form. It's hard to get behind a two-dimensional villain when he doesn't even look like he belongs in the movie. It is very apparent when the group of actors is in front of a green screen as while the color palette is rather impressive, it just tends to look very fake quite often. Cyborg himself tends to have a lot of inconsistent visuals and it could be the reason why he has a hoody on for much of the film, however; I feel that was more of a cost-cutting measure than anything else. About the only impressive effects the movie delivers on is how they showcase Barry's speed. It's drastically different than the show and features a much better use of the speed force. If they keep up this level of visual polish for the character in his solo film, then we are in for a real treat. Justice League gave me much of what I wanted from the movie; a live-action spectacle of seeing the team in action. There are only a small handful of action scenes as much of the film is the team coming together and going over the plan, but those few action scenes are well done and compliment the casting choices rather well. I still feel that a few characters got the short end of the stick and were not featured as prominently as I think they should have been, but that could be a result of the short run-time for a movie of this caliber. Justice League is a vastly flawed film that featured as much pre-release criticism as the hype around it. DC is scrambling to get their movie universe up and running as Marvel has been successful for almost 20 films now. Justice League is a solid course correction for the studio and while it was a mess of a production, it appears to be taking the feedback the studio has received over the prior release of films. I have my hopes that WB will release an extended cut so that the movie can be viewed in its full-length glory because I think, to not show us this cut, would be a grave injustice. PRODUCED BY: DC films/ rat pac ent. / Atlas ent. / Wb pictures.